Part 1 – The Importance of Azimuth and Altitude. The theory of astro navigation depends on the ability to solve the spherical triangle PZX in the diagram below. The azimuth and altitude enable us to calculate the Local Hour Angle (LHA), declination and zenith distance of a celestial body which is the essential data that we need to calculate a position on the Earth’s surface. 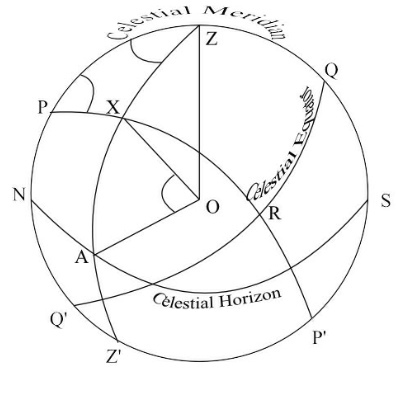 The Azimuth is the angle PZX in the diagram (it is, the angle between the observer’s celestial meridian and the vertical circle through the celestial body). The Azimuth is similar to the bearing in that it is the angle between the observer’s meridian and the direction of the celestial body. However, whereas bearings are measured clockwise from north from 0o to 360o, azimuth is measured from 0o to 180o from either north or south. If the observer is in the northern hemisphere, the azimuth is measured from north and if in the southern hemisphere, it is measured from south. For example, if the true bearing is 045o, in terms of azimuth it is either N45oE for an observer is in the northern hemisphere or S135oE for an observer in the southern hemisphere. Local Hour Angle (LHA). LHA is the angle ZPX; that is the angle between the observer’s celestial meridian and the meridian of the celestial body. The Altitude is the angle AOX in the diagram; (it is the angle from the celestial horizon to the celestial body measured along the vertical circle through the celestial body). The Zenith Distance is the angular distance ZX measured along the same vertical circle from the zenith to the celestial body; that is the angle XOZ. Since 1 minute of arc subtends a distance of 1 nautical mile on the Earth’s surface, we know that the distance of the true position from the geographical position of the celestial body will be 3,459.6 nautical miles in the approximate direction of the compass bearing 261 o which when converted to azimuth is N99oW for an observer in the northern hemisphere. (More on this in the next post). However, because of the impracticability of plotting a position line of such an immense distance on a large scale navigational chart, this does not tell us our exact position. The next post in this series will explain how we can establish an astronomical position line by calculating the difference between the zenith distances of the DR position and the true position.